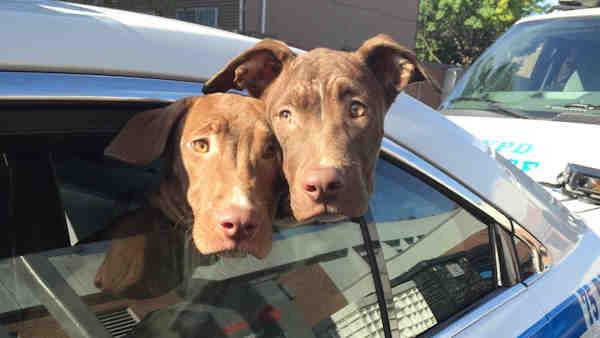 EAST NEW YORK, Brooklyn (WABC) -- Two emaciated puppies living in filth were rescued from a Brooklyn home by police officers searching for a suspect. New York City Police Department Warrants Squad officers said they arrived just before 8 a.m. Tuesday at 25-year-old Devon Fenton's Chestnut Street home in East New York. Fenton was not there, but officials found two dogs, male and female, with no food and water, and covered in their own feces and urine. Their ribs were protruding, but their tails were wagging. They were named Chestnut and Doscher by the officers and were taken to the precinct for food and water. Fenton was found later at his brother's house, and charged with misdemeanor animal cruelty and an earlier assault.